make it EASY to open and close! "Ergonomics: An applied science concerned with designing and arranging things people use so that the people and things interact most efficiently and safely." The Ultra Brace™ for tour-paks provides a functional upgrade to your touring bike allowing the lid to open to the optimal position. 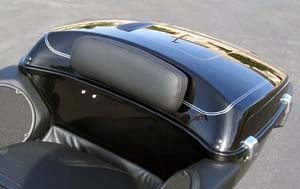 Compliments or replaces the stock cable or tether that goes between the tour-pak lid and body. It allows the lid to open fully but not flop over. 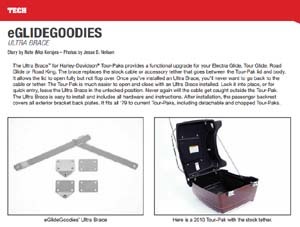 Once you've installed an Ultra Brace, you'll never want to go back to the cable or any tether; the tour-pak is that much easier to open and close. 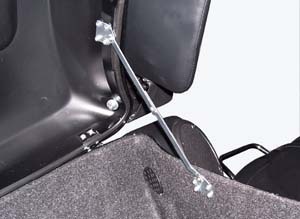 An open tour-pak with an Ultra Brace has a narrower profile to allow easier parking in your garage. 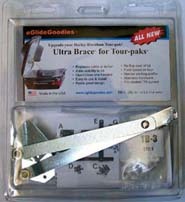 The Ultra Brace™ is easy to install and includes all hardware and instructions. 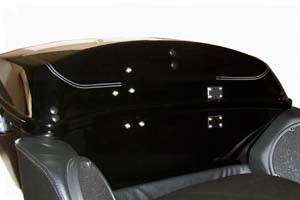 After installation, the passenger backrest covers all exterior bracket back-plates. It fits all '79 to current tour-paks, including detachable, chopped and razor tour-paks. 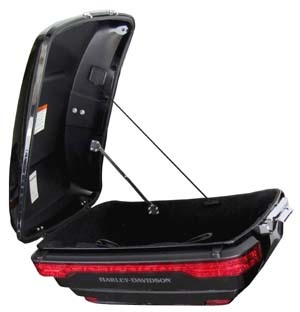 It works especially well on tour-paks outfitted with a luggage rack or with our lid or wall-organizer and fits tour-paks with the H-D remote CD changer or automatic light accessory. Operation: The Ultra Brace™ allows the tour-pak to be opened/closed easily with one hand to an optimal position...right where you want it. 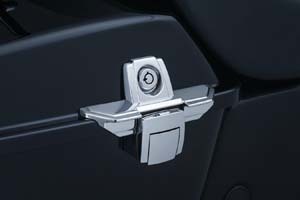 With the tour-pak open the Ultra Brace can then be left in the unlocked position for quick access to your gear. 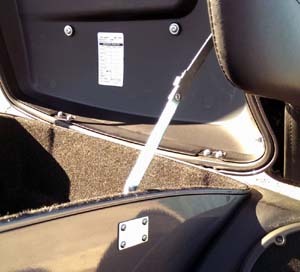 If needed the Ultra Brace can also be put into a locked position for extra support of a full luggage rack or lid organizer. Closing the tour-pak lid is also an easy one hand motion from the unlocked position. From the locked position, simply unlock first then close the lid. Never again will you have to allow the lid to flop over or will the cable get caught outside the tour-pak. TB-3: Ultra Brace for the Harley-Davidson tour-pak. 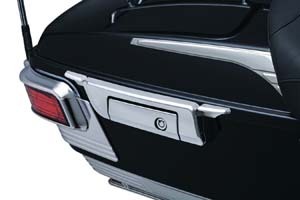 Silver zinc plated to match the inside of the tour-pak with stainless steel hardware. 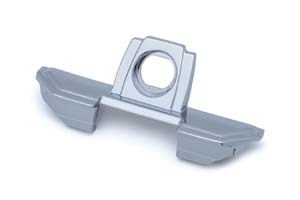 The new TB-3 improves the bracket angle for optimal installation ease and tour-pak lid open/close operation. TB-3I: Ultra Brace for the Indian Roadmaster trunk. 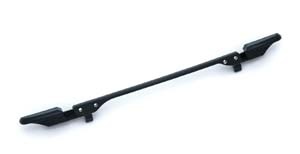 TB-3V: Ultra Brace for the Victory Cross Country trunk. 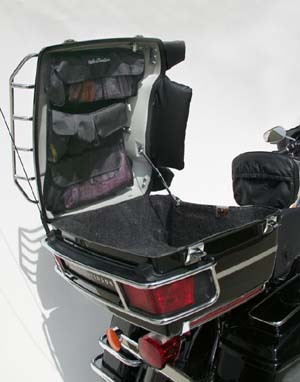 TB-3K: Ultra Brace for the Kawasaki Vulcan Voyager trunk. 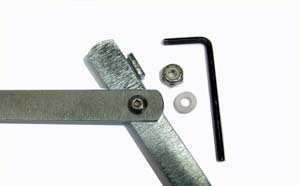 TB-AJ: Allows you to change the TB-3 brace-arm assembly fastener compression so that you can adjust & fine tune the tightness up or down from the factory setting. 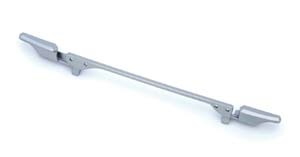 Special low profile stainless/nylon hardware and hex arm included. 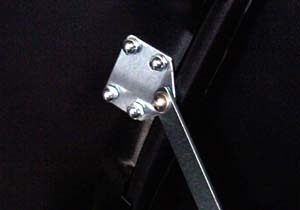 TB-CN: Finish off the inside of your tour-pak by completing your installation with this Cap Nut hardware upgrade. "I just wanted to drop you a note to say how GREAT your Ultra Brace Kit (TB-3) is and how glad I am to have one on my new bike!!! I had read good reviews on message boards before, but never had the desire to throw that many bucks at my old tour pak. I recently purchased a new Anniversary model Road King, and outfitted it with a brand new tour pak with all the bells and whistles I could put on it, and felt that it was as good a time as any to spring for the Ultra Brace Kit. I am totally impressed with the rock solid feel of the lid and am glad to rid myself of that annoying and very intimidating cable!!! 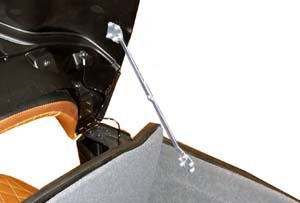 TP-PK: If you're not riding with a passenger, removing the ~5 lbs passenger backrest pad will improve the ergonomics of opening/closing your tour-pak lid. 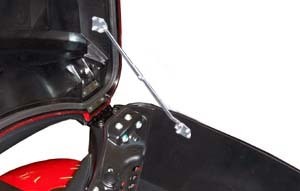 The Tour-pak Plug Kit installs in the backrest mounting holes making the lid substantially lighter and giving the bike a more utilitarian appearance. When you're in and out of your tour-pak often, you'll immediately notice the improvement. Compliments the TB-3 Ultra Brace. Fits model year 2014+ tour-paks. 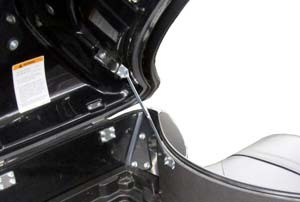 Note: If you've removed your AM/FM or CB antenna, the TP-PK also plug the holes, finishing off the rear of the tour-pak. 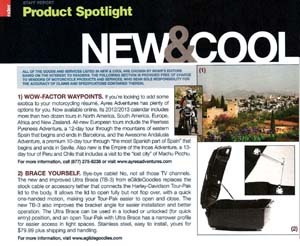 See our Slim-Ergo Backrest Pad for even more ergonomic improvements when opening/closing your tour-pak. 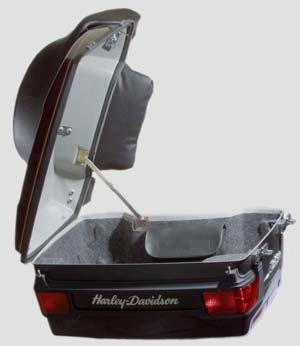 At only 6 ounces, reduces the weight of your tour-pak lid when you know you'll not be carrying a passenger. LG-6: The compact and stylish Tour-Pak Lid Grip companion piece provides a convenient lifting point to grasp when opening the lid. 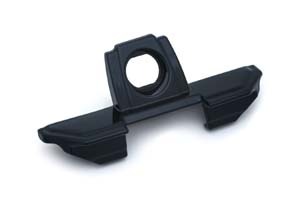 Protect paint and prevent wear and tear with this sleek and unobtrusive finger-hold that attaches to the Tour-Pak lid and latch mechanism on '14-later Tour-Paks, and the locking mechanism bolt inside '06-'13 Tour-Pak lids. One lift is all it takes to feel the difference. Chrome and gloss black.